Traffic was a BEAST this morning & this evening… WHY YOU ASK??? Cause it rained!!! 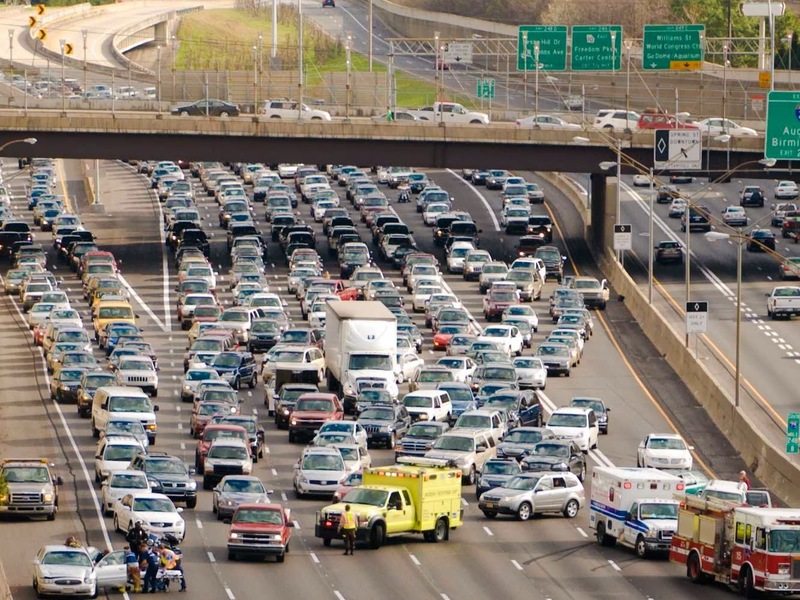 I’ve been saying this for years but I’m convinced that ATL has the world’s worst drivers. Let it sprinkle for 5 minutes, the highways turn into Atlanta Motor Speedway, an 18 wheeler jack knifes, a car drives off a bridge, a motorcycle drives into a lake, there is a 10 car pileup & every other highway in the city is grid locked. I’m convinced it’s a conspiracy theory that the Atlanta government is trying to cover up. Back when ATL was an up & coming city they were trying to figure out “HOW do we get ppl to move to the south? Down to this oasis in the woods that we call ATL?" The government decided that they would give all sh*tty drivers around the US a “get outta jail free card” or a clean driving record if they relocated here. I mean really, how else could we have so many jacked up drivers here? These ppl are like NASCAR drivers with a death wish! Through all this mayhem & foolishness there is usually one group of ppl that have it made in the shade & that’s dem dayyyyym HOV lane ppl *side eye*Many moons ago I had this BRILLIANT (and I’m not kidding its still brilliant) idea to create an inflatable person that I dubbed HOV Homie. You plug HOV Homie into your lighter & he bobs his head to the music (& now that I think about it, it would probably be fresh it he put one hand in the air & threw up some deuces or some ish) so when you pass the fuzz while ur cruising in the HOV lane, you are Good To Go!!! I really don’t understand why they just don’t get rid of the dayym HOV lane & give us another lane, is it not OBVIOUS by the backed up traffic that we need it? Any who, So then during lunch I let this car cut in front of me when all the other cars cut him off & he didn’t even say thanks. You coulda waived ninja, not that I’m gonna waive back or anything, but that’s 30 seconds outta my lunch break that I will never get back.